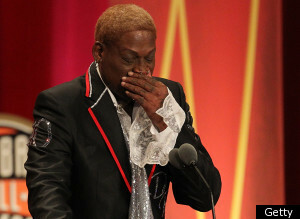 Dennis Rodman's speech during the Basketball Hall of Fame induction ceremony was one of the most raw and eduring speeches I have seen in a very long time. His speech finally gave us a glimpse of the man (or rather wounded child) behind the mask. What he revealed was beautiful and tragic. It takes a lot of courage for a person to reveal his/her true being and that's exactly what Rodman did with this speech. Oh wow! Gotta appreciate his honesty. I really hope that he is able to cope with whatever he is facing and gets whatever help he needs to be around. I was a major Bulls fan during the 90s. Michael and Scottie were the best 1-2 punch the game had but the addition of Dennis made them the most formidable three players in the game. Can't believe how fast time flies such that all 3 are now in the HOF.